Physical Security Online > Security > Personal safety > Airport Security Scanners: are they hazardous to your health? 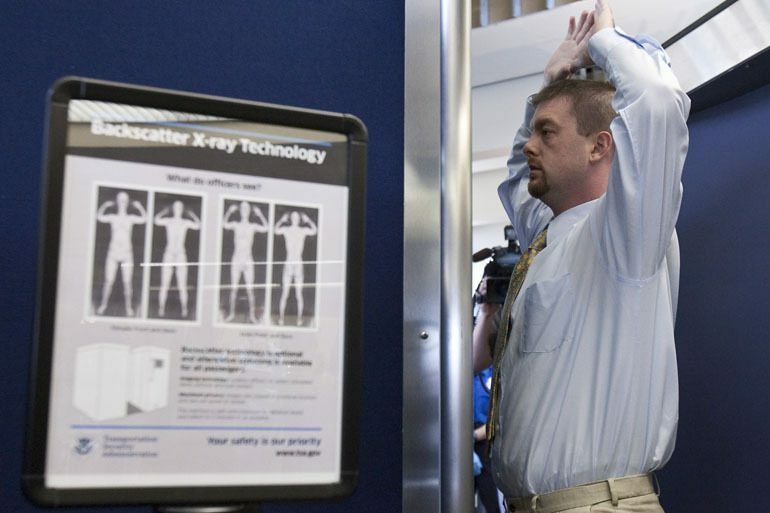 Before they were removed following an outcry over privacy, backscatter X-ray security scanners at airports also raised worries among some travelers and scientists about exposure to potentially harmful radiation. After all, the machines use ionizing radiation to produce those very graphic body images. Now, with the TSA considering redeploying a second generation of such scanners, a new report allays some concerns while leaving other questions unanswered. The machines, pulled in 2013, expose travelers and airport workers to a dose of radiation well within acceptable limits – a factor of ten below recommended safety standards – concludes the National Academies of Sciences, Engineering and Medicine, a private nonprofit organization chartered by Congress to provide expert technical advice. Even in a worst-case scenario, the report says, if the device malfunctioned and focused the beam on one part of the body, it would not cause tissue damage or result in overexposure.The scanners were installed in airports in 2008 as secondary screening devices, but were stepped up to the primary method after a passenger tried to set off a bomb in his underwear on a 2009 Christmas Day Northwest Airlines flight. One at a time, passengers step inside the scanners, plant their feet hip width apart, and raise their arms, as if surrendering. A panel slides back and forth and, seconds later, the scan is completed. The committee studied two devices, a Rapiscan Secure 1000 and an AS&E SmartCheck scanner, that are now in storage. The airport scanners currently in use enlist radio waves – rather than ionizing radiation – to produce images, which are displayed on standard outlines of human bodies, instead of depictions of a person’s actual physique – as was the case with backscatters. The study, called for by the Department of Homeland Security, followed legislation introduced on Capitol Hill in 2012 seeking additional review, as well as concerns by some scientists that the devices, whose radiation doesn’t penetrate the skin as deeply as medical X-rays, could nonetheless pose a skin cancer risk or other problems. Four experts from the University of California, San Francisco wrote the assistant to the president for science and technology in 2010, saying existing research wasn’t adequate and that the devices might pose a skin cancer risk. While it found the dose to the skin is not elevated, the report may not end the debate. “I don’t know if anything could,” said Harry Martz Jr., director of the Nondestructive Characterization Center at the Lawrence Livermore National Laboratory in California. Martz chaired the committee of scientists, physicists, statisticians and other experts who wrote the report. That’s partly because the NAS committee was specifically directed not to analyze whether the safety standard – set by the American National Standards Institute/Health Physics Society – is adequate. So are the machines safe? “We were not asked if they were safe or not, just whether they meet the standard, said Martz. The committee was also specifically barred from commenting on whether the TSA should use the machines even though the radio-wave alternative exists, which doesn’t use ionizing radiation. That the dose of radiation falls well below safety thresholds – and is less than what a body absorbs from cosmic radiation while flying across the country – is not surprising, but is only one part of the equation, said David J. Brenner, director of the Center for Radiological Research at Columbia University Medical Center. He did not work on the report, but has seen a copy. Earlier studies generally found the devices provide a level of radiation well below health and safety standards, the report noted. After conducting its own tests using additional research methods on the two scanners, the committee concluded that the dose absorbed even by small children or developing fetuses would not exceed the standard. It cautioned that any second generation machines should have a way to ensure that they do not screen a traveler longer than the short time needed to get an image – and that daily tests on the scanners are used to check that they are operating within limits.